If you and your family or group of friends love the beach and the tranquility of a small town full of restaurants, this spacious apartment in the Dominican Republic is the right place! 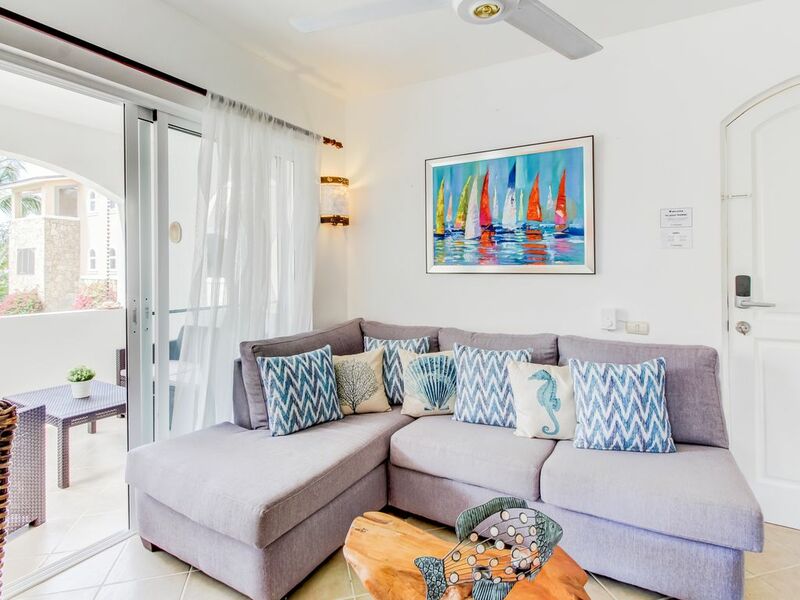 This exotic vacation rental features a modern living room and well-equipped kitchen with everything you need, a crystal clear shared swimming pool, free WiFi, and a furnished balcony with comfortable chairs where you can enjoy the views. You will be surrounded by palm trees and local trees, which gives this property the exotic and tropical vibe you’ve been looking for! You can also bring your dog with you! This vacation rental is a five-minute walk from the most beautiful crystalline beach of the Dominican Republic, so make sure to bring your sunscreen with you! Also, you will be close to delicious seafood at restaurants like Tracadero! If you’re looking for something more adventurous, you’ll also have access to different tours to Isla Saona, Isla Catalina, and snorkeling, scuba diving, and sailing excursions. Parking Notes: Parking Gratis dentro de la residencia.